A photograph which is fairly self-explanatory. The lady shown here, and the worker behind her (presumably another lady) are filling sacks with salt by the simple expedient of opening a hatch in the salt store and letting the free-running salt flow into them. The photo was taken, according to the information we have sometime in the 1960s and certainly before 1966 when the works closed. 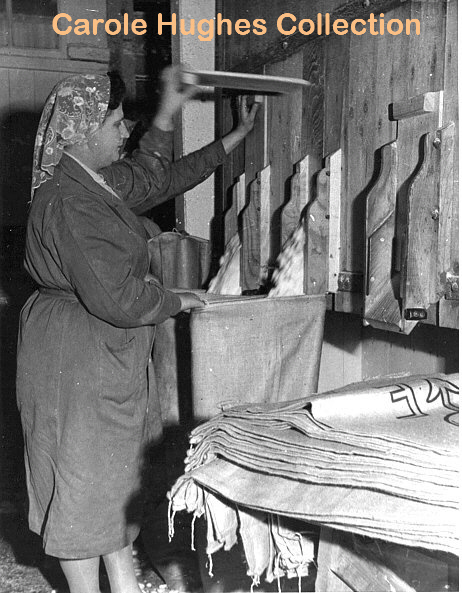 By this time women had, through the introduction of various Factory Acts and other legislation, long been banned from working in the arduous salt making process itself, but many of them were employed in jobs such as this, and also in stitching and check-weighing the sacks before despatch. As can be seen from the photograph, the working conditions were very basic, and would never be tolerated these days. There's a photograph on page 29 of Wych & Water (Middlewich Vision 2009) showing exactly the same process being carried on at one of the Seddon's works. In the present day anyone travelling on the road from Middlewich to Sandbach - or travelling in a more leisurely way on the Trent & Mersey Canal - can get a good view of the vast salt stockpile at British Salt where pallets full of bagged salt are loaded onto lorries for onward despatch. Occasionally you can see a dumper truck loading loose salt in the same location. This is not to be confused with the 'salt mountain' in a different part of the site which famously helped rescue the country's roads a few years ago during bad winter weather.